This is the first time I've joined in this bloghop. He had to stay with his Nan while his mum was at work. They had to go in to town to the library to get a book his Nan wanted. He wandered down the aisles between the two huge book shelves towering above him. His Nan always told him how reading was exciting and how you could get lost in a book. He always told her reading was boring. His dad said he was dyslexic like he was. He wanted to be like his dad. His mum said his dad didn't study at school and was naughty and that’s why he didn't have a job now. His dad was always busy though. His dad had a car. His dad had an X-box. His dad had a big television. His mum worked four days a week and was always tired. His mum said they didn't have enough money. So his dad didn't work and he had enough money and was going to a concert in London next week. He didn't understand adults. His Nan had left him to wander through the library while she went and chose her books. She needed to find something on how to get rid of the mole hills on her lawn. Granddad had asked her to find out. He didn't know why she didn't just Google poison for moles. That would sort them out. 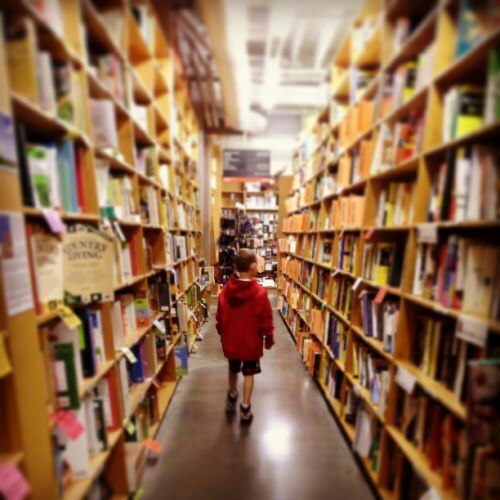 He tilted his head back and felt the strain on his neck as he looked up at the shelves. Who wrote all these books? Where did all these words come from? Why did people read books? There was a book just poking out, tantalising him. He could just see the cover. It had a picture of some dragons on it. Perhaps it was to do with a computer game. He reached out with his hand and took it down from the shelf. His fingers trailed over the picture as he held it in his left hand, his right hand hovered over the fly leaf as he opened the cover and started to read. He sat down cross legged on the floor and pulled the hood of his red jacket over his head. He reached in to his pocket and pulled out the napkin he’d saved from lunch and wiped his hands so they were clean as he turned the first page. He leaned back against the sturdy bookshelves as he became lost in another world of magic, myth and flying monsters. He looked up with glazed eyes as he slowly came back to reality. ‘Can I keep this book, Nan, please,’ he asked. That's how it happens! Nice! I really liked how you made us think as a child thinks...contradictions in life. And in my mind I could see him choose the book and begin reading. Books really can change so much. Well done. How does this work? Does everyone have the same photo and words? It seems like a fun and creative blog hop. It's interesting to see how you wove those words into the story. Hi Wendy, We are given a photo or picture prompt and five randomely chosen words and you have maximum of 500 words to play with every week. Thanks for the explanation. But don't look for me -- I don't have much creativity left. HA! Isn't it great how things can be weaved from a single book or picture? This blog hop's the same. I'm glad you joined. It does help let out our creative juices. I really enjoyed your story and thought it was particularly clever how you worked in the bit about cleaning his hands on a napkin. Your love of reading shines through, nice job! I agree with Vicki—that was a nice detail! I enjoyed your story. Books are powerful indeed. I noticed with the A to Z how well you are do at getting inside a character's head and this is no different. I love his internalizing, love that he grasped a joy of reading. With a rough childhood, that can end up helping him so much. The short, simple sentences did a good job of relaying the child's POV. Nicely done! Well done on your first venture for this blog hop. I enjoyed sharing the sense of wonder as the first discovery of books is made.